The Sig Sauer P320 Compact is a marvel in the holster and at the range. Find out how good yours looks in one of our Sig P320 Compact concealed carry holsters. The P320 Compact is a striker fired, double stack 9mm semi-automatic pistol. This gun measures in at 5.3 inches tall, 7.2 inches long, and 1.4 inches wide. It is classified as a “duty pistol” in most marketing. Don’t let that fool you though, it conceals just fine in the right holster. It is roughly the same size as the Glock 19. 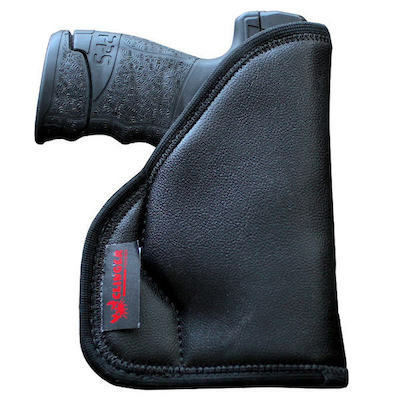 The P320 Compact has a rough texture on the grip which allows you to control it better. It is a full sized grip so most people should be able to hold it comfortably. The serrations at the front of the slide make it easy to press check your weapon and the ones toward the rear of the slide make it smooth to rack. The forward slide release is located on both sides of the frame within simple reach. The magazine release is adaptable between either side of the frame. The P320 Compact is a fine shooter. The textured grip allows you to maintain control and the larger frame assists with the minimal recoil. The P320 Compact is a delight to shoot and is quite the looker. She is reliable, adaptable, and concealable. Don’t forget to pick up a couple of Sig P320 Compact Holsters for concealing this amazing firearm. This gun is perfectly sized to take with you most days. Sure there’ll still be days when you need your smaller gun. However, if you dress around the gun, the P320 Compact won’t be hard to conceal most days. Besides, it’s much easier to shoot than a Single Stack 9mm. Wouldn’t you prefer to have a very shootable gun if a predator crosses your path? Carry this rig in a great Sig P320 Compact Kydex holster and you’ll be ready for anything.